Fine, Benjamin and Rosenberger, Gerhard. 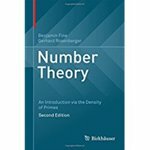 Number theory : an introduction via the density of primes, Second edition. Switzerland: Birkhäuser (2016). Fine, Benjamin and Rosenberger, Gerhard, "Number theory : an introduction via the density of primes, Second edition" (2016). Mathematics Faculty Book Gallery. 5.